Worldwide Stone and Tile specializes in stone and tile projects involving new construction, alterations to existing buildings, and interior spaces. Their extensive project portolio reflects their dedication to expert craftsmanship. Worldwide Stone and Tile was in search of a web presence that would display their expert craftmanship with a photo-rich portfolio and and serve as a successful lead generation tool. We let Worldwide Stone and Tile's extensive experience and capabilities beyond contracting drive key messaging. To complement and support these claims, we developed a photo-rich portfolio to give real-world examples to show Worldwide Stone and Tile is capable of handling complex projects. Worldwide Stone and Tile specializes in stone and tile projects involving new construction, alterations to existing buildings, and interior spaces. Their extensive project portolio reflects their dedication to expert craftsmanship. Worldwide Stone and Tile has the ability to measure, prepare drawings, fabricate and install as simple or complex residential or commercial projects may be. Worldwide Stone and Tile was in search of a web presence that would display their expert craftmanship with a photo-rich portfolio and and serve as a successful lead generation tool. This new website needed to reflect this and prove that Worldwide Stone and Tile understands their customers on the deepest level. It wasn’t enough to simply showcase Worldwide Stone and Tile’s capabilities. Instead, we needed to put ourselves in the shoes of a prospective client. So, we let their extensive experience and capabilities beyond contracting drive key messaging. To complement and support these claims, we developed a photo-rich portfolio to give real-world examples to show Worldwide Stone and Tile is capable of handling big, complex projects under intense pressure and while facing high customer expectations. 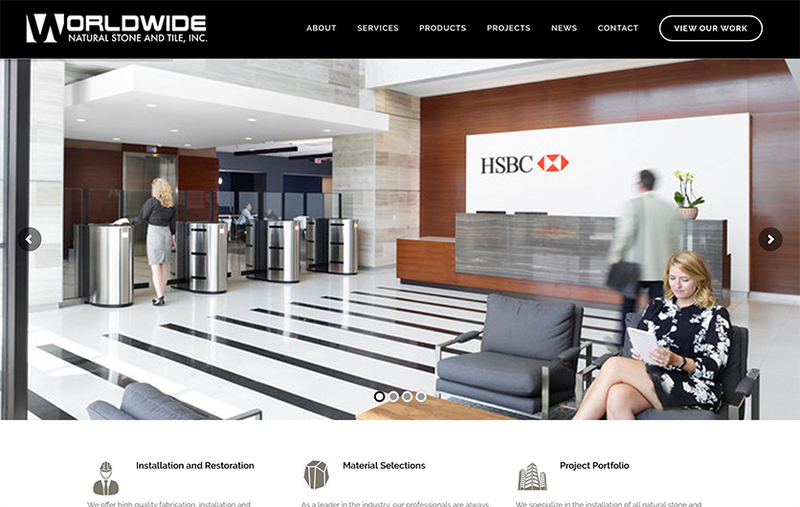 From a creative standpoint, we represented their project portfolio using sliders imagery that’s different than what you typically see on a natural stone and tile website. So, we leveraged impactful imagery that strays from the obvious representation. 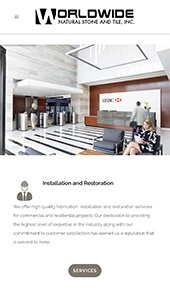 On top of equally representing their project work, we needed to do the same for their multiple service offerings including: fabrication, installation and restoration. This was achieved by carving out a dedicated services section.